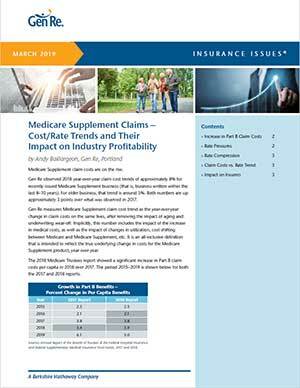 Gen Re's Research Center in North America is pleased to share some highlights from our recent Medicare Supplement Market Survey. The full survey covers results and market trends for 2017, capturing sales and in-force data, claim metrics including trends and staffing, underwriting tools and practices, rate increase activity and distribution details. The full report is made available only to participating companies. A total of 52 questionnaires were completed for this year’s survey, representing 74 companies with Medicare Supplement (Med Supp) business. Throughout this summary, the percentage (or number) of companies refers to the 52 completed questionnaires. Additionally, depending on the type of question, not all companies were eligible to answer. To aid in your review, the number of responding companies is displayed as “R=”. In previous surveys, results were segmented based on active versus closed companies. As this year’s segmentation is based on open versus closed blocks of business, the current growth rate cannot be directly compared to historical results. Participating companies reported $22.2 billion of in-force premium for 2017, representing an increase of 6.3% over 2016. (Exhibit B) When focusing only on open blocks for companies actively selling Medicare Supplement, the growth rate increases to 15.2% for in-force premium. On average, Plan F accounts for 46.3% of the total sales premium in 2017 and remains the most sold plan. (Exhibit D) Excluding two companies that sell only in waiver states, all participating companies sold Plan F in 2017. In comparison, more than 65% of the participating companies reported selling Plans A, G, and/or N; these three plans combined represent 38.8% of sold premium in 2017. For 2017 the average reported lapse rate (including mortality) was 9.7% for open blocks and 13.1% for closed blocks. (Exhibit H) Compared to 2016, 47% of open blocks experienced an increase, 32% experienced a decrease, while the remaining stayed the same. Over half (56%) of closed blocks experienced an increase year over year. 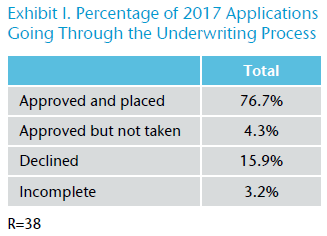 On average, 76.7% of underwritten applications were approved and placed, while 15.9% were declined in 2017. (Exhibit I) When focusing only on the 33 companies that provided data for 2016 and 2017, the decline rate increased from 16.5% to 17.5%. The average turnaround time on an underwritten application in 2017 was 5.1 business days. For the purpose of this survey, an automated underwriting system was defined as a system to approve underwritten, web-based applications without human involvement. 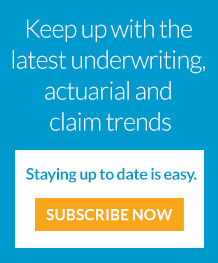 Eight of the 40 companies use an automated underwriting system and seven companies plan to implement a system within the next 24 months. Over half (54%) of the participating companies reported they are currently selling direct-to-consumer. This was defined as selling a Medicare Supplement policy over the phone, online, via mail or a combination of these methods without assistance from a traditional agent who is paid a traditional compensation. Most companies use an in-house call center as well as online support for their direct-to-consumer business. (Exhibit J) Six companies reported using both in-house and third-party call centers. Download the PDF version for a list of participating companies. Produced by the North American Research Center, these are summaries of our industry surveys for the Critical Illness, Disability, Life and Medicare Supplement markets. The full surveys are available only to participants.